Home Security and Energy systems based on the AlertMe platform. Topic: FORUM FUTURE - Please Vote! Re: FORUM FUTURE - Please Vote! FORUM FUTURE - Please Vote! How are things going on this now; the videos look very interesting! Absolutely, I'd be more than happy to take them off your hands! Topic: Cheap smart home plugs – same quality? Re: Cheap smart home plugs – same quality? Sounds fantastic. If you're abstracting the server code from the devices, it should be relatively straightforward to add devices from multiple manufacturers like 'plugins' to the main system. Excited to see what you come up with! Topic: British Gas have been in contact! Re: British Gas have been in contact! Topic: AlertMe have been in contact! Re: AlertMe have been in contact! I'm afraid there is no simple alternative right now. 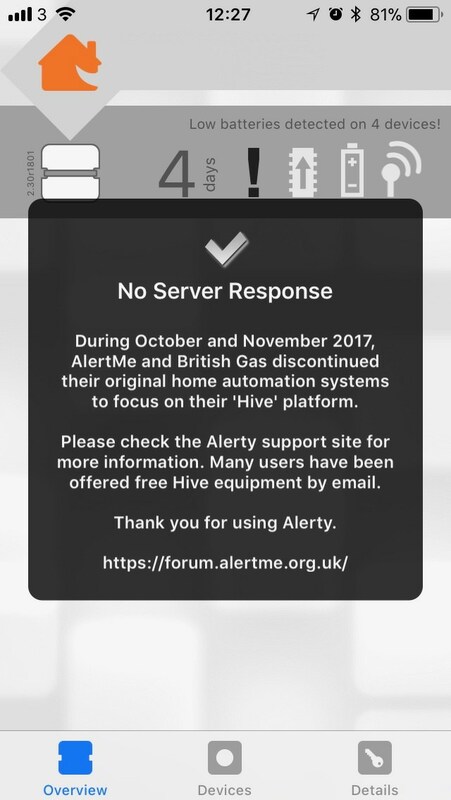 Your best bet would be to take the offer of a Hive system, or contact support@alertme.com if you haven't seen an email about it. Topic: What other security/ alarm systems are you considering? Re: What other security/ alarm systems are you considering? Topic: Implementing a dummy server? Re: Implementing a dummy server? It's all happening here and here at the moment. Lots to do, but it's possible. Have a check for the IP address of the camera on your router. Once you've found that out (it'll likely be 192.168.1.3 or similar) visit that address with your browser - it should open a web page where you can twiddle with the configuration. Just a little notification that as of now, the AlertMe servers have gone offline. RIP, api.alertme.com - nice working with you! For the time being Safe & Secure is still online, but I'd guess that will be shut down by the end of November. If anyone figures a way to hack the hub or make it connect to a local server so we can still use the sensors that'd be great. First working attempt to automate a SmartPug. British Gas have been in contact! I have not received anything from AlertMe. Drop them a line - support@alertme.com. They were very helpful. Topic: Is the API dead? Is Alertme finished? Re: Is the API dead? Is Alertme finished? The API is far from dead - alive and kicking and most of the docs have been published here now! Topic: Access to AlertMe docs. Re: Access to AlertMe docs. Thanks - it might be a good idea! I'm rather at a loss as to how people manage to keep these phpBB boards clean, particularly when nothing seems to stop the account registrations of the spammers. Leave it with me a bit and I'll see if I can sort it out. Topic: Is this the end? Re: Is this the end? Just seen these; I didn't notice any problems at my end, though I've not been into the portal for a few days. Alerty seemed to keep working for me just fine, but then I was only turning on and off a few plugs. That does look like an interesting kit! Best looking gear I've seen since AlertMe - do post back and let us know how you get on with it! The videos are served out via RTSP - just right click on the video and you should get an option in your browser to 'save as' or copy the link to it. You'll then need something capable of saving from RTSP feeds; probably VLC would do it. Really? That's no good. They most certainly do still manufacture them. Updated opening post with latest info. Wow, that's disappointing. When I was last in contact with them (only a few months ago) they were very much in favour of people having API access. Who was it that you were in contact with? Craig Chandler was my contact and he was very helpful. Right, the app should now be available in all App Stores and now has support for British Gas Safe & Secure systems! Topic: Home monitoring - only a matter of time? Re: Home monitoring - only a matter of time? dannydev wrote: So my question is how long is it locked for or do i have to email AM and ask them to unlock it for me? I did this some time ago and if I remember correctly, I had to go back to the AlertMe website and do a 'forgotten password' reset. That unlocked my account and had me up and running again. Topic: Anyone tried ninja blocks? Re: Anyone tried ninja blocks? daroca wrote: Can someone confirm if it is just my account. It's not just your account - I can no longer get access either. Hmm, this is not good news. Thanks for bringing it to my attention. wobbles wrote: I have sent you a PM but it is still sitting in my Outbox for some reason. Yeah, they sit there until they're read. Read and responded now! Blimey, good work! It would be lovely to get the sensor values locally rather than having to go via the web API, so please let us know how it goes! mw631774 wrote: I've raised the issue with PlotWatt and the developer of the API on GitHub. Just wondered if anyone got their AlertMe system working with PlotWatt at all. I remember trying, but I'm sure I hit an issue at the PlotWatt end as well. Didn't have much time, so I just abandoned it, I'm afraid. Topic: Continue or move on? Re: Continue or move on? Certainly will. Any device that you could buy from AlertMe previously will still work if you buy it from British Gas. It's actually AlertMe's recommendation; they've said they will fully support a system configured with devices from BG. Just don't expect the new, BG-specific devices to work! All the security gear needs to be bought through British Gas these days. Looks like they've got the UK exclusive on it for now. Hehe - I'm still to play with SiriProxy, but that would be a fantastic use of it! Topic: AlertMe API version? Still v2? Re: AlertMe API version? Still v2? APrettyBee wrote: Draft API.... There's probably a few of these nuances in there. Hehe, they've been 'draft' for years. That's great stuff. I was going to start looking at baking some AlertMe stuff into a site and this has really saved me some time! 'Fraid I have no news - I'd love to get a system to do some testing with, but the cost of that on top of my actual system makes it somewhat restrictive! Hopefully someone else will have had a play with this. Wow, that is a shame. I'll be giving them a call tomorrow to see what's going on. Interesting that they were selling the same products as British Gas, but cheaper, and by quite a margin. Topic: Worth buying new kit? Re: Worth buying new kit? Haha! Really? Sorry about that! I've got all the kit I need at the moment (in fact, some may well be going back up at some point), so there'll be no competition from me. Unless someone's selling a lamp, of course. If you're making use of the system, I'd say yes. Check on eBay - I've picked up some bargains on there. There's not always something, but kit does crop up from time to time. Looking forward to how you get on! I have a Button in pieces at the moment, primed to be integrated into our house's traditional doorbell once the hallway is decorated. I think with the components available, there's definitely some good hacking fun to be had! Topic: AlertMe planning new features? Re: AlertMe planning new features? wildcat wrote: Does anyone know the new support phone numbers? Didn't know they'd changed.. You could try a quick chat session from your account and ask them if they're not in the usual places. Madass wrote: I also have an alarm detector that is at 2.2r1. Anyone confirm if theres is the same? I've only just got my hands on an alarm detector, so I'll let you know once I've started using it. If you give the help desk a shout though, they'll upgrade all of your devices if they need it. Wow - interesting stuff! How did you get access before the OS fires up? On the original hub it very quickly dives into launching Linux, so I've never been able to turn on SSH or get root access. wpiman wrote: There are $99 at Lowes. I live in the United States. The internal circuit board says it is a Alertme.com mini hub v2. 2011. Really, $99? Do you get any sensors with that, or is it just the hub unit? wpiman wrote: Did you try the usual suspects? For a security system, I'd have been disappointed if it were that simple! You can only have one forwarding address in IFTTT though, can't you? Do you have the alertme@alertme.com address set as that? I came into AlertMe via the non-subscription route, so I just hadn't clicked that you could so this via email. IFTTT would be perfect for this. Great thinking! There's an AlertMe Facebook page? Do you get the same data issues using the traditional dashboard stats (My History > Graphs)? I've always found these to be pretty reliable (and a better style) than the new-style dashboard. My Hub has been fine, but then I've only ever connected it to the Draytek and my Netgear switches. Very true. If you change the GPL'd stuff, you have to make those changes available. But you can run your own copyright code on Linux and there is no requirement to make the source for that available. Topic: Did AlertMe put their clocks forward? Re: Did AlertMe put their clocks forward? Shout it from the rooftops! The clock is correct again! How have people been getting on over the past couple of weeks? I've had the odd 'reappeared' message in the logs, but nothing more problematic than that recently. ...and it's back this morning. I wonder if it's a maintenance task or something running on the server that's killing the login? If it is, they really need to sort it out. Confirmed here. API is down, web login is dead. It's really not good enough, if while these systems are off the security side is essentially useless. Okay, API now seems to be back and web login has let me in, but no data on dashboard. Hate to say it, but I see the same thing. No emails received, but the web login and API appear to be down. They switched to 10mbps a while ago for 'stability reasons', but I've never really had any trouble. Connected directly to the Draytek Vigor 2700. You're half right; the SmartPlugs do act as repeaters (they extend the ZigBee wireless mesh, so devices can be further away from the Hub and still connect to it), but they don't offer any increased processing capability. Same goes for the Lamp. Had to laugh at myself there. I genuinely thought you meant Halo the video game, not Halo the home security system. Is the Halo camera the same model as the AlertMe / SiteCom one? No problem! How strange that an AIFF headered file works! Well, please post back here and let us know how you get along. Would be good to know. Not sure I quite understand what you're asking here - are you wanting to use a different ferrite clip with the AlertMe transmitter box (maybe possible, depending on the clip and connector) or interface a whole different box with the Hub (not possible, I wouldn't have thought). Not really any tips, I'm afraid - other than I think I just used .wav files. Worked perfectly for me out of the box (used to use one of the effects from iChat as an indicator that a keyfob had arrived home). Did AlertMe put their clocks forward? Still no fix for this time issue. Spoke on Friday and they don't even have a timescale of how long it might take. I may have quipped that it would resolve itself come October. Well, would you look at this! AlertMe are in the Red Herring Top 100 for 2012! Despite the name, this is not a bad thing. Perhaps we're going to see all this take off soon. roobarb! wrote: Hehe. I've just noticed that this forum is still on GMT. Right, well, I've changed the settings in the board config and under your User Control Panel (top left) you can configure BST under 'Board preferences'. Topic: The New Dashboard that never was! Re: The New Dashboard that never was! The new dashboard exists. It works. It's in use every day. Just not by us AlertMe customers. Now if you're a British Gas Safe & Secure customer, then you get this. Seems somewhat familiar, doesn't it? There's a problem with the web interface now, as well. Update 1: Oh, and the server now seems to be down. No API, no pings. Update 2: Page seems to be back (pings would appear to be ignored), but still no login. Update 3: Login now works, but dashboard loads no data. Yup, that's me. I almost uploaded an update yesterday - but then realised I broke more than I fixed. One day! Fantastic! I've been waiting for someone to do this for ages. Resisted the temptation to sneak around in my own hub because it is actually sat there, behaving itself and being an alarm system. terry wrote: The online dashboard is slow to update. Someone probably forgot to feed the hamster. Topic: Going back to original security system! Re: Going back to original security system! I very much enjoy the description of the Button. "Deters and frightens intruders while alerting the neighbours." Yes, it is terribly scary. Not tried, but tempted. So long as certain settings remain editable in the firmware, it might be okay (even if they need setting manually). Topic: GPRS Signal - How's Yours? Re: GPRS Signal - How's Yours? GPRS Signal - How's Yours? Topic: Any alternative systems ? Re: Any alternative systems ? That's handy stuff. I'm not a .net person myself, but it's nice to have a peek at the way this is done. Brilliant stuff - thanks for posting! Might have a play with this later. That is interesting - could you post the link, as the one I'm using doesn't show me anything like that. I bought a bagful from eBay because I found getting them at a decent price was tricky. They have all worked perfectly so far. Topic: Welcome to the AlertMe Users' Forum! Re: Welcome to the AlertMe Users' Forum! Welcome to the AlertMe Users' Forum!